I, literally just walked past this gravestone this afternoon, and thought, "whoa .... that rings a bell". So I had a closer look. I was very happy that it was the player that I thought it was because this is a very special Falkirk player. Jimmy Callander should be the merest footnote in the history of Falkirk FC, he played in four matches in total, spread over several seasons only scoring once. He played at Inside-Right in all, scoring his only goal for the club in the last of these matches, but as you can see he was hardly our good luck charm. The reason for the scarcity of matches for the club is quite simple. He was not a Falkirk player. Throughout this period he was was playing as regularly as he could for his main club : Falkirk Amateurs. Football has never been the most reliable of trades for those who ply it so James instead studied to be an architect. With very good reason, because it seems he was rather good at it. Many of his designs survive to this day. Most prominent among his clients was the Falkirk Co-operative society, and the old Co-op store on the corner of Kirk Wynd and Bank Street [now a Clydesdale Bank] is his most recognisable achievement. But those of you who have an eye for the Art Deco style of the 1920s & 1930s can also see his hand in the cinema on Princes Street [now a nightclub], the shops in Callandar Riggs [coincedence] at the Bus Station, and the Callander Arms pub across the road. He also helped design or alter buildings which no longer exist such as part of Aitken's Brewery and several of the foundry offices around the town. But, for a Falkirk Football Club history blogger like me, by far and away the jewel in the crown is that James Callander not only played for the club, he also designed the old grandstand at Brockville Park. I like the circularity of that. Sadly though I have no picture of him, I will keep searching. 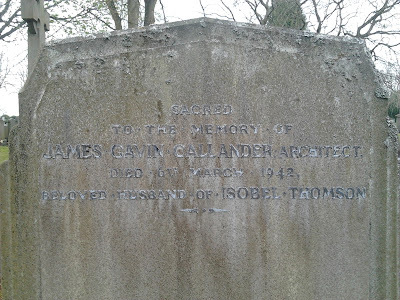 Note, today [28/07/2015] I was sent an image of James Callander by his Great Neice [thanks Jean], though not in his footballing days. It seems he was a founding member of Glenbervie Golf Club, and he is in a picture on their website.